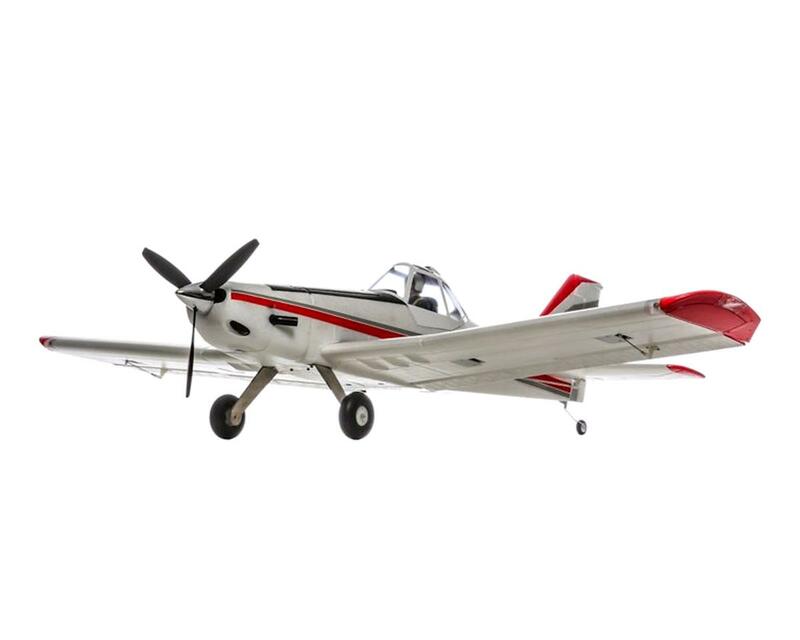 The E-flite Pawnee Brave Night Flyer is a scale park flyer that is ideal for the intermediate pilot who wants a nimble airplane that can be flown practically any time of day. Like a respectable crop duster should, this scale-inspired design packs plenty of power under the hood. Besides four-channel control and a steerable tail wheel, working NAV lights add a touch of realism that make getting up early for flights at dawn more than tempting. Even more vibrant is the hollow-core structure that’s been filled with a push button controlled, LED lighting system so that it’s practically impossible to lose this model in the dark. In addition, finely-tuned AS3X technology adds the kind of stability that makes dusting the ground low-and-slow a pure joy. The agriculture business attracts a wide range of pilots - all wanting to make screaming down on the deck and between power lines a seasonal job. Dedicated crop duster designs truly put the needs of the pilot in the forefront with features like protective cockpits and gobs of power to make tight turns safe. Happening upon a crop duster in action over a lush field of grain is equivalent to an impromptu air show complete with low passes and graceful arcing turns. 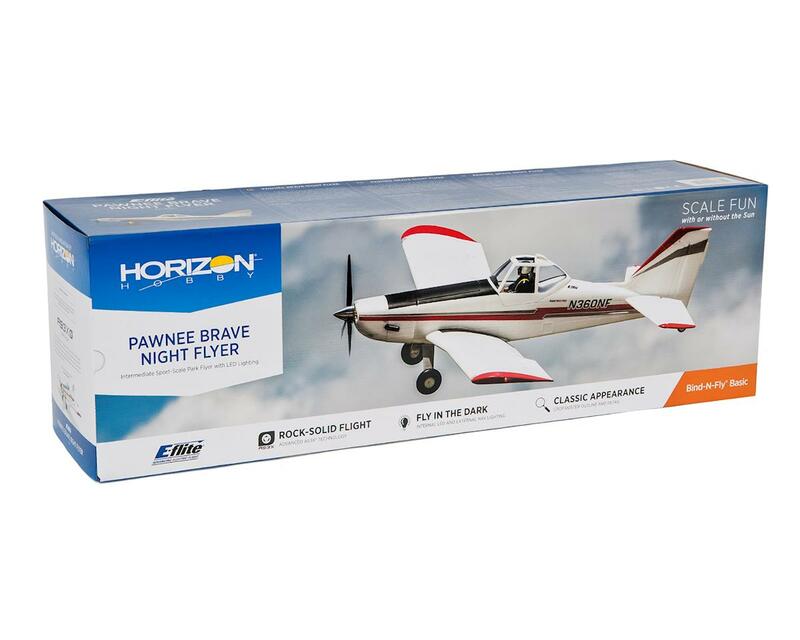 The E-flite® Pawnee Brave Night Flyer model allows RC pilots to dart across the field just like the real thing, day or night. The advanced AS3X® (Artificial Stabilization – 3-aXis) system built into the Spektrum™ 6-channel AR636A receiver is what helps give the E-flite® Pawnee Brave Night Flyer an incredibly solid look and feel in the air. It works behind the scenes to help counter the effects of wind and turbulence by combining 3-axis sensing with specially tuned flight control software. As a result, a nimble crop-duster like the Pawnee Brave is made even better because your workload to fly smoothly is significantly reduced. The hollow-core structure of the Z-Foam material has been filled with white LED lights. Just press the button inside the battery compartment and the entire airframe will brilliantly glow in the dark. Inspired by the full-scale, external navigation lights on the wing tips, plus the landing light recessed into the wing lead edge offer an addition sense of flight orientation. You can add a higher level of scale performance by making the built-in flaps functional. All the hardware has been provided to suit the addition of two micro servos (servos not included).